Aid makes up only 1% of the Australian Government’s budget. According to a Lowy Institute poll, the average Australian would like 12% of the Australian Government’s budget to be spent on aid. This is over 10 times as much as currently given in aid. The Defence budget is around fives times larger than the Aid budget. The Australian Government’s recent purchase of fighter jets cost well over twice as much as the Aid budget. Aid is such a small share of the Australian Government’s budget that it would take over 125 years worth of the Aid budget to pay off government debt. Next week the new Australian Government will hand down its first budget. As foreshadowed in the recently released Commission of Audit report there will be major cuts to public spending, which is highly likely to include the Aid program. At this time it is as important as ever to put the size of the Aid program in perspective. 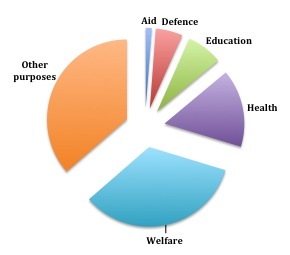 Aid makes up only around 1% of the Australian Government’s expenditure. As the chart below shows this is quite small when compared to other expenses such as Defence. However one could be forgiven for thinking the Aid budget is larger than this, given that in the name of bringing the budget back into surplus various Australian Governments have cut the aid program a total of five times in the last two years. Over $10 billion dollars has been cut and almost another billion dollars redirected to pay for refugee costs. The most recent cuts indicate that the new Australian Government has disproportionally targeted the aid program. Last year the Government announced they would cut $6 billion from the budget bottom line over the next 4 years, of which three-quarters would be taken from the aid program. All these cuts have been coming from such a tiny proportion of the Government’s overall budget. Further cuts to the relatively small Aid budget is not in line with the wishes of the average Australian. According to a poll conducted by Australia’s leading foreign affairs think tank, the Lowy Institute, the average Australian would like 12% of the Australian Government’s budget spent of aid. This is over 10 times as much as currently given in aid. ← How much more income do the poor need to reach the extreme poverty line?